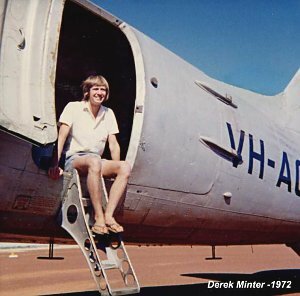 After leaving school in England I joined Hunting Surveys, who were at that time probably the largest airborne survey company in the world, as a Data Compiler in their airborne geophysics department. After nine months training I was sent to Angola on a five month long survey, learning about the joys of flight path recovery and data QC. The work came to an abrupt end when our DC-3 was machine gunned by rebel forces whilst flying at 500 feet and limped back at base with 23 holes through it and one hole in the co-pilot, who fortunately survived. Life back in the UK seemed a little dull after that and as my next overseas field trip might be years away, I resigned, packed a rucksack and travelled overland to India with some friends and then on to Australia to seek our fortunes! We had landed in Darwin with empty pockets and looked for work. I was hired by a ground geophysics crew who needed an extra hand for a few weeks out near the East Alligator River, it was ideal with food and a tent provided. Afterwards I travelled on to Brisbane to catch up with the others. Work was difficult to find and although I contacted all the survey companies I could find, and had interviews with QASCO and CGG nothing came of it. We were fortunate and found work for several months with Rheems, manufacturing 44 gallon drums. When our finances had recovered we bought a car and headed for Sydney, found a flat at North Bondi and looked for work again. I had heard of Adastra while working for Hunting and so they were amongst the companies contacted and I was invited for an interview. Adastra were currently after two airborne geophysics jobs and, if they succeeded with either, agreed they would take me on for the duration. I was prepared to wait and spend a month or two on the beach, exploring Sydney and visiting friends. Eventually word came that they had been awarded a contact although flying would not start for some weeks. For some time I had been feeling quite unwell, headaches and 'flu like symptoms came and went until I was in bed most of the time and getting very weak- well, dying to be accurate! Eventually we got the local doctor to visit and I was taken straight into hospital. Malaria was soon diagnosed - presumably contracted months previously during my travels. I was worried that I would lose this opportunity with Adastra and left hospital as soon as possible, thin, pale and weak and just in time to start work on the survey preparation in the office at Mascot. My work with Adastra got off to a bad start when, on the first day, my manager approached me and said we should talk about my salary. He claimed to have no knowledge that we had agreed during my interview that I should be paid $80 per week in fact denied that this had happened. Eventually I had to agree to $70 per week instead! As I had committed myself to this work for so long I had little choice but to accept but it did leave me feeling somewhat resentful. I settled down to work, using a corner of Kevin Murrey's room. He was a great guy and very skilled at photo mosaic assembly. The three Hunting personnel arrived (Dave Richards-Geophysicist, Bob Taylor-Electronics, Tony Putman-Data Compiler) to complete the team and the next day we all set off for Halls Creek in the DC-3, Dave Brennan flying and John Cousins standing in as navigator until John Messenger could join us later. Our first night was spent at Bathurst - we had only left that afternoon so the client could be told we had started - it was too late to go far! The next day after a delayed start due to mist we flew to Broken Hill. The following day it was on to Alice Springs for fuel, and then to Halls Creek. The Hotel Kimberley was great, clean rooms, good food and helpful people who found us a small room to use as an office. I set up a darkroom at the airport and we started to fly. Halls Creek was different to any town I had stayed in before, I remember the Met. man also drove the towns only taxi, rented out rooms in has house, helped behind the bar and hoped to retire after this posting! My hair was getting very long (even for those days) - [see the photo of me sitting on the steps of VH-AGU with long hair and still very thin from malaria] and as there was no barber in town, Ruth, the lovely barmaid, cut it for me sitting there in the pub! We worked hard and the days passed. Mine started with an early morning film developing session at about 6am (the chemicals were too warm during the rest of the day) and then most of the day working on flight path recovery onto photo mosaics which was pretty tricky in places. When the magnetic and spectrometer records that arrived back from the sortie, we checked them and also produced flight path overlays - often working late into the night. This had the 'advantage' of limiting the amount of time spent in the bar! About ten weeks passed and we gradually finished the job and a few extensions to the area. Operationally all went smoothly with no aircraft and only one electronic breakdown that I recall. On the rare days that I wasn't busy a day out in the plane was about all the entertainment available. In the evening we played pool in the bar and went weekly to the open air cinema, it always seemed to be cowboy films. The day came to leave Halls Creek and as I made my way to the DC-3 for the transit back to Sydney I discovered that the crew had an extra 3 members. The aircraft engineer had a small dingo puppy under his arm, apparently someone had shot the mother and this kind hearted guy had agreed to adopt it. On the tarmac beside the aircraft was a large metal cage and inside were two baby donkeys. Dave Brennan had arranged for these to be captured so that he could fly them back to Sydney for his children! Oh joy of joys we were going to spent many hours shut in the plane in the company of these wild creatures! The moment came when the cage and its cargo had to be lifted in through the open cargo doors of the DC-3. A few volunteers came forward and we all lifted, it was quite heavy but up came the cage off the tarmac. Of course the donkeys, already pretty stressed, just empted the contents of their bowels (and very full they must have been!) all over the tarmac and us below in the lifting party… we were all covered in green manure which of course is much the best way to begin a flight across Australia! Eventually all was stowed away and we left Halls Creek with all manner of God's own creatures aboard. The flight remained uneventful if somewhat smelly until were getting near NSW and Dave radioed ahead to air traffic control to tell them the good news - we were on our way back and had some delightful pets on board. Soon a message came back telling him that if we landed in NSW with the donkeys on board they would be shot and the aircraft impounded! It was decided that we would divert to Oodnadatta (the donkeys could be taken into SA without problem, or maybe he just didn't tell them!) and we would spend the night there while a new plan was formulated. We checked into the hotel and the couple who ran the place agreed to take the donkeys off our hands. I guess they must have taken the dog as well as the next morning we flew back to Mascot a little less like Noah's Ark! The Hunting personnel departed for the UK and I spent the next couple of weeks finishing off the work, back in Kevin Murray's office, uncertain of what my future might hold. Eventually my boss came to talk to me and asked if I would be interested in staying on with Adastra, working on the geophysics side when that work was available and helping Kevin with his mosaics when geophysics was slack. This was exactly what I had hoped for until he told me that they couldn't pay me so much if I became a full time, and could only justify $60 per week! When I would not agree to another reduction in money he asked if I would return and work on future geophysics contacts when and if they were awarded them, I agreed, of course!! I left the next day. Within a week I had departed Australia and after a holiday in SE Asia I returned to London. I visited my friends at Hunting to be met with great surprise - Adastra had been looking for me for some weeks, they had had another small job in South Australia and as I was away Hunting had sent Chris Rowlands (who had been in the same intake of trainees as myself) to Australia to do 10 days work. His airfare alone was the equivalent of about two years of the $10 that I had been denied! Hunting very generously offered me my old job back but I declined and went to work for Fairey Surveys of Maidenhead, where I still live, they who ran a small airborne geophysics department at that time. I worked on projects in Egypt and Nigeria for them. In 1975 I joined GeoMetrics, an American company located in San Jose CA and spent the next two years in Zambia in charge of the data QC of their largest ever project. They used a US registered Navajo and an Oz registered Islander for this work. I met and married Kate who was a VSO working in Zambia in 1976. In 1977 we were transferred to the USA and worked on a series of local projects including helicopter work over the Rockies using a Lama and fixed wing work using an ex-military Grumman Tracker. Our first child was born in 1978 and we returned to the UK where I worked as a photogrammetrist at Fairey (later Clyde) Surveys for seven years. In 1985 I joined Exploration Consultants Limited (ECL), a large hydrocarbon and minerals consultancy group, where I currently run the Maps and Graphics department. Thanks to Dave Richards for providing photos of the animal passengers referred to in Derek's account.